This time of year, the relentless Oregon winter gloom, accompanied by rain, snow and pogonip (ice fog), turns my thoughts to Hawaii. I've always had a soft spot for "the islands". My father lived on the big island (Hawaii proper) forever. My daughter and her family resided on Oahu, just outside of Pearl Harbor off and on for several years. 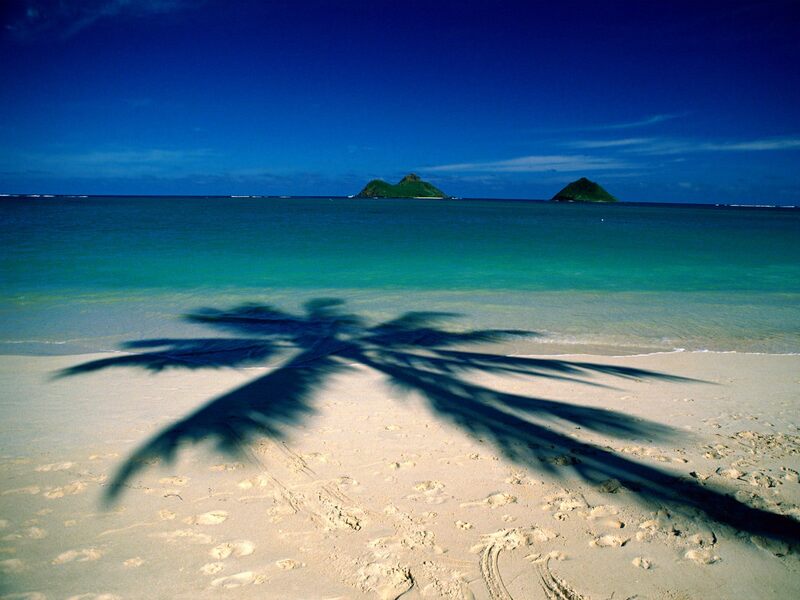 I've spent my share of time on these islands, as well as Kauai and Maui. There's just something about the warm sea air, tropical breezes and billowing white clouds that soothes the inner beast. And of course, there's the history~ Lots and lots of history; much of it intertwined with the pre-prohibition San Francisco wholesale liquor trade. 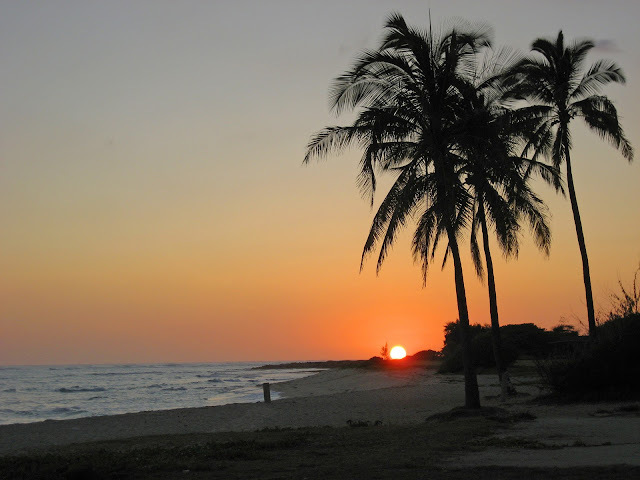 Molokai, Hawaii and Oahu are all well known for the quantity and quality of western tooled and glop top whiskies found there. The towns, cane plantation dumps and mountain ravines have in the past (and continue to) give up treasures. Treasures with names like Spears Pioneer, Cutter, M. Rothenburg (cluck - cluck), Lilienthal, and Spruance Stanley all abound in collections over there. Hilo, Kona, Lahaina, Wailua, Ewa, Kihea, and of course Honolulu, have all produced spectacular S.F. whiskey finds over the years. And we can't forget to give due credit to the whiskies indigenous to Hawaii proper. A thriving liquor trade existed from the eighties through to prohibition. The oldest, C.L. Richards & Co. - Honolulu S.I. (Sandwich Islands) dates to around 1858, is olive green and should by all rights have a big ol' blowpipe or iron pontil scar on the base. As far as I know, there's only two in existence. Next in the batting lineup is the slug plate MacFarlane & Co. 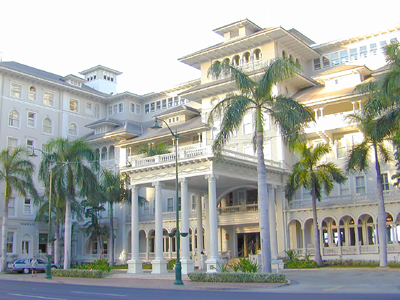 I've spent countless hours in the archives, located on the Iolani Palace Grounds in downtown Honolulu. There's a wealth of information there, if one is patient and dogged enough to figure out how and where it's stored... MacFarlane (actually G.W. & Co.) dates back to the early eighties. He was first located in the Beaver Block, a two-story structure located at Fort and Queen Streets, which was completed in 1882. Progressive, his building sported the first elevator (albeit manual and not electrified) in the islands, allowing patrons easy access to the second floor, from the Beaver Saloon located on the first. Competition must have been stiff as the front page of the January 1, 1887 (Honolulu) Daily Herald has multiple advertisements for Hackfield, Lilienthal, Spruance Stanley, Martinelli, and of course, MacFarlane. Conjecture has long been tossed about that MacFarlane & Co. actually became part of the Lilienthal corporate umbrella and the slug cylinders bear more than a passing resemblance to the Van Schuyver and Crown Distilleries slug plates. If so, the merger occurred post 1887 as evidenced by this newspaper. The MacFarlane slug plate was made over a wide time span, and as such, the bottles evolved from the crude glop tops of 1882, into the neatly made tool top era, ca. 1910. Walter Chamberlain Peacock, abbreviated to W.C., was another successful wholesale liquor magnate whose success spanned many years. W. C. was originally an English businessman. Upon his arrival in the islands in 1881, Peacock entered into the Hawaii wholesale liquor arena with George Freeth. Later, Freeth took leave and the firm of W. C. Peacock & Co. was born. In 1890, Peacock had the Royal Saloon Building built in Honolulu’s Chinatown district at Nu‘uanu and Merchant Street. As his liquor fortunes continued to pile up, he branched out and had the 75-room, 4-story Moana Hotel constructed, which opened in Waikiki on March 11, 1901. Each room featured a bathroom and telephone (luxurious amenities at the time). The hotel also boasted Oahu's first electric elevator. The bottles produced for the Peacock empire range from the red whittled "German Connection" glop tops of the nineties, through the neatly tooled era. Most of the later bottles look as though they could have been blown yesterday. Sadly, prohibition spelled the end for the wholesale liquor portion of Peacocks financial success story. Lovejoy & Co. can be positively dated as far back as 1899. 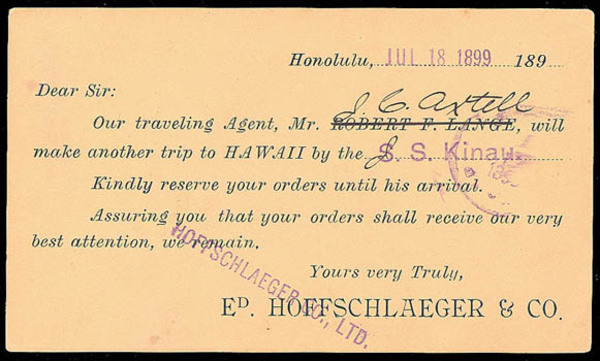 The Honolulu Republican announced that one parcel had arrived aboard the S.S. China on Jan. 4, 1899 and another on the S.S. Alameda on Dec. 6, 1899, destined for Lovejoy & Co., but was being held pending receipt of duties to be collected by the U.S. government customs house in Honolulu. Hawaii had been added as a US territory in the summer of 1898 and an ongoing battle between the feds and the local merchants had been simmering for months (sound familiar?). A lengthy search of the archives revealed that David H. Lewis and John D. Holt were the principals doing business under the firm name of Lovejoy & Company. Interesting to note that both Peacock and Lovejoy sued the Republic of Hawaii on March 29, 1899, in an attempt to recover their goods. The disposition of the case is not known although all indications are that they lost the suit since the classified ads announced an upcoming auction of their goods some months later. Regardless, Lovejoy & Co. continued to prosper well into the 20th century. Although not, common, the amber tooled cylinder is a mainstay in most western whiskey collections. Last, but not least, enter Hoffschlaeger & Co. I found one reference to Ed Hoffschlaeger & Co dating as far back as 1889, although there was no indication of whether he was involved in the sugar business or in retail goods at that time. I was able to trace the firm proper, as liquor dealers, back as far as 1895. The (Honolulu) Independent posted an advertisement on Nov. 7 for Ed Hoffschlaeger & Co, located on King St. opposite Castle & Cook, dealing in Wines, Liquors & Beers of the highest grade. He also boasted a large selection of carpets and rugs, along with sewing machines, baby carriages, pianos, organs and guitars. Sounds like a 19th century version of Wal-Mart if you ask me... A like ad, that appeared in the Daily Bulletin dated October 30, 1893, is virtually identical, but lacks any reference to liquor. Hoffschlaeger too, was a victim of held goods by the Customs House having one package withheld from the shipment that had arrived aboard the S.S. China on Jan. 4, 1899. 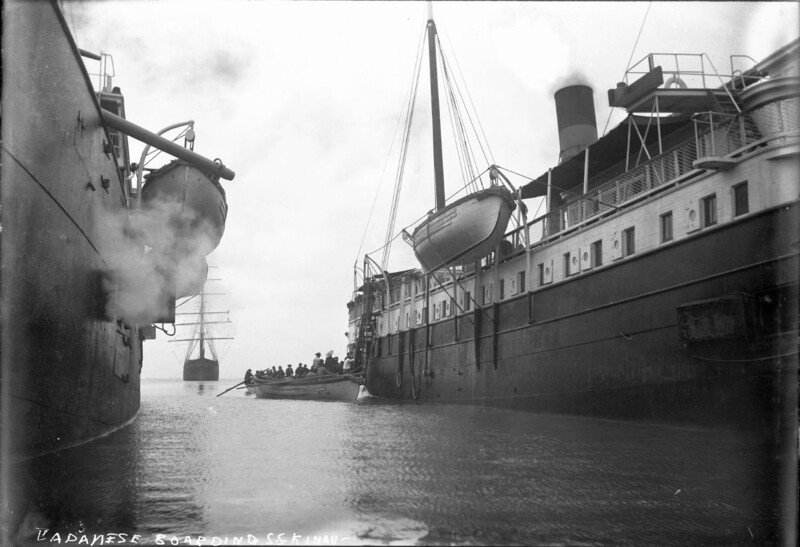 The S.S. Kinau was part of the Wilders S.S. (steam ship) Co. fleet of mail ships that made a constant and revolving circuit around the island chain at the turn of the century, delivering goods and mail. The preceding trade card announced to the inhabitants of the big island, that their orders from Hoffschlaeger & Co. would soon be filled. Since the firm does indeed date to the tail end of the applied top era, there could quite possibly be a globby floating around somewhere. At this time though, all are neatly made with tooled tops in shades of amber. Most are quite light, although I've seen one that approaches espresso in color. Like Lovejoy and Peacock, the firm prospered until being killed off by prohibition.